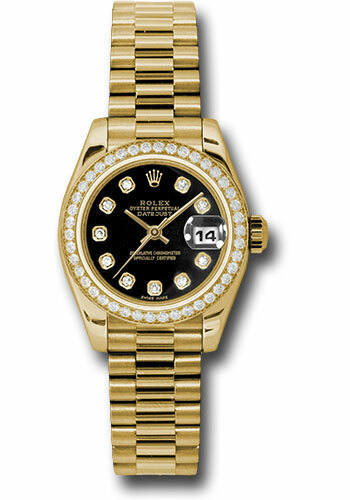 26mm 18K yellow gold case, bezel set with 42 diamonds, black dial, diamond hour markers, and President bracelet. 26mm 18K yellow gold case, bezel set with 42 diamonds, blue dial, diamond hour markers, and President bracelet. 26mm 18K yellow gold case, bezel set with 42 diamonds, champagne dial, diamond hour markers, and President bracelet. 26mm 18K yellow gold case, bezel set with 42 diamonds, champagne jubilee dial, diamond hour markers, and President bracelet. 26mm 18K yellow gold case, bezel set with 42 diamonds, champagne decorated mother of pearl dial, Roman numerals, and President bracelet. 26mm 18K yellow gold case, bezel set with 42 diamonds, champagne dial, Roman numerals, and President bracelet. 26mm 18K yellow gold case, bezel set with 42 diamonds, mother of pearl dial, diamond hour markers, and President bracelet. 26mm 18K yellow gold case, bezel set with 42 diamonds, mother of pearl dial, Roman numerals, and President bracelet. 26mm 18K yellow gold case, bezel set with 42 diamonds, silver dial, diamond hour markers, and President bracelet. 26mm 18K yellow gold case, bezel set with 42 diamonds, silver jubilee dial, diamond hour markers, and President bracelet. 26mm 18K yellow gold case, bezel set with 42 diamonds, white dial, diamond hour markers, and President bracelet. 26mm 18K yellow gold case, bezel set with 42 diamonds, white dial, Roman numerals, and President bracelet. 26mm 18K yellow gold case, case lugs set with 24 diamonds, bezel set with 42 diamonds, black dial, diamond hour markers, and President bracelet. 26mm 18K yellow gold case, case lugs set with 24 diamonds, bezel set with 42 diamonds, blue dial, diamond hour markers, and President bracelet. 26mm 18K yellow gold case, case lugs set with 24 diamonds, bezel set with 42 diamonds, champagne dial, diamond hour markers, and President bracelet. 26mm 18K yellow gold case, case lugs set with 24 diamonds, bezel set with 42 diamonds, champagne jubilee dial, diamond hour markers, and President bracelet. 26mm 18K yellow gold case, case lugs set with 24 diamonds, bezel set with 42 diamonds, champagne decorated mother of pearl dial, Roman numerals, and President bracelet. 26mm 18K yellow gold case, case lugs set with 24 diamonds, bezel set with 42 diamonds, champagne dial, Roman numerals, and President bracelet. 26mm 18K yellow gold case, case lugs set with 24 diamonds, bezel set with 42 diamonds, mother of pearl dial, diamond hour markers, and President bracelet. 26mm 18K yellow gold case, case lugs set with 24 diamonds, bezel set with 42 diamonds, mother of pearl dial, Roman numerals, and President bracelet. 26mm 18K yellow gold case, case lugs set with 24 diamonds, bezel set with 42 diamonds, silver dial, diamond hour markers, and President bracelet. 26mm 18K yellow gold case, case lugs set with 24 diamonds, bezel set with 42 diamonds, silver jubilee dial, diamond hour markers, and President bracelet. 26mm 18K yellow gold case, case lugs set with 24 diamonds, bezel set with 42 diamonds, white dial, diamond hour markers, and President bracelet. 26mm 18K yellow gold case, case lugs set with 24 diamonds, bezel set with 42 diamonds, white dial, Roman numerals, and President bracelet.